Well – *cough* – I know that German might not be the language of love. Okay, maybe it can sound a little bit rude sometimes. Others might even say that it sounds horrible. And there are these ignorant people that only know the sound of German from speeches of Nazis out of documentaries on TV. Nevertheless, on the one hand side, German CAN be beautiful! Well, on the other hand side, you have to consider that German is simply a rather direct language. So, where English speaking people wouldn’t use the imperative because it might sound rude, Germans use it to express things more directly. 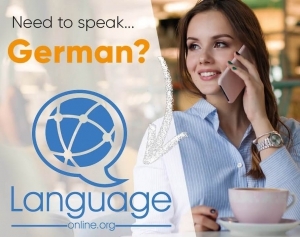 So, as you have chosen this article on language-easy.org, I think you’d like to enter into this part of German grammar. In the following, we will try to clear up in which contexts you can use the German imperative. After that, we will define what it actually is and have a detailed look at its usage. And now.. VERLIEREN SIE KEINE ZEIT! … We have a lot of work to do! So, let’s just start right ahead with the basics of German Imperative. Well, first of all we should talk about when you actually should use the German imperative. Obviously, it depends on the context. In the following, we will list some situations where the usage of German imperative is absolutely right. Exactly, for offering encouragement, you can use the German imperative. “Mach das!” (Do it!) is a quite usual way to express your encouragement for something. Well, whether you describe the way to the restaurant or you tell the guy who does housekeeping for you in your vacation what to do… The German imperative is just a short and precise way of expressing your instructions. Of course, there are also idiots in Germany, as in every country of this world. So, just use the imperative to express that you don’t agree with the rude behavior or just to tell someone to go away. “Hau ab!” (Go away!) would be a good example for that. Now, as we have talked about the context is which you can use the German imperative, let’s go the most important parts of this article and look at its definition and usage. Well, first of all we should clear up what the German imperative actually is. So, the German imperative mood expresses requests and commands. So, you can apply this order someone to do something. “Fahren Sie mich nach Hause!” – Drive me home! Or, you can also express order including yourself. “Gehen wir!” – Let’s go! You can use this mood to talk to people in the second person singular and plural and, of course, polite form and the first person plural. Please, keep in mind that the German imperative mood is quite common in the German language. Well, that’s because of its ‘attributes’ – its simply the most efficient way to express something. Exactly, that’s very German. Although this may sound rude to you sometimes, it is not meant like that. And,p in case you want to be more polite, just add “bitte” (please). So, let’s come to the central aspect of this article about German imperative. Well, it’s conjugation is actually not too difficult. Unfortunately, there are some exceptions. In the following we will have a closer look at each one of them. 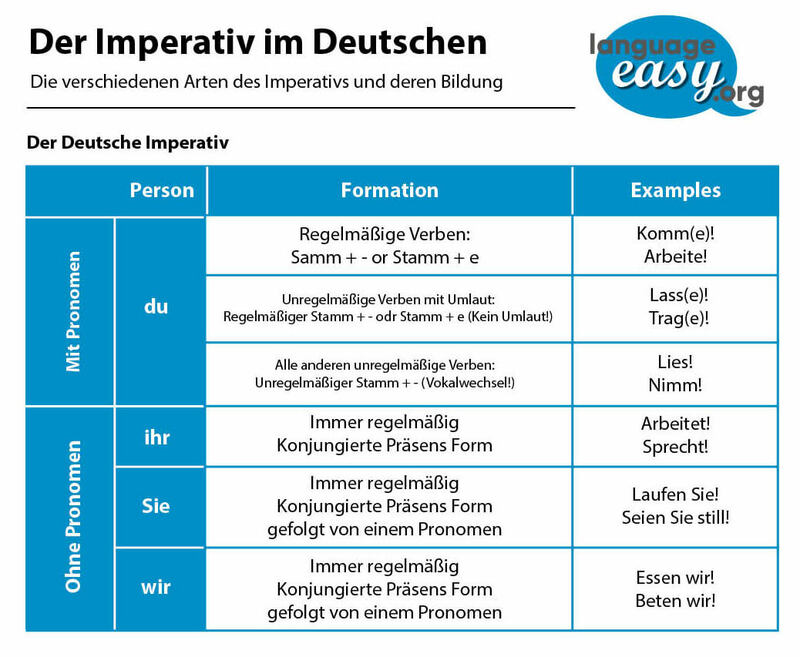 So, this first form of the German imperative is quite easy to form. Well, we just use the infinitive form + “Sie”. Like we know, we use the “Sie” always if we want to show respect. Also the pluralform works the same. Unfortunately this form is a little bit more difficult. Actually, we form the imperative of “du” by removing the ending ‘-en’ from the infinitive. But, in elevated language we often add an ‘-e’ to many verbs, but in colloquial speech we generally leave it off. Well, as I have already told you, there are some exceptions in the context of German imperative. So, I think we should just do a short list all the most important ones to get a good overview. Third, if the verb end in ‘ein’ or ‘ern’, we always should add an ‘e’. Bedauere das bitte nicht! Forth and last, the root vowel change from ‘e’ to ‘i/ie’ also happens in the imperative; in this case, however, we never add the imperative ‘-e’ ending. Of course, you will have to do the translation work. By the way, in case you want to go deeper into future tenses, have a look at this excellent article on Wikipedia. In the following you will see some phrases that you should complete with the correct terms. Once you have filled all the gaps, just click on the “correct” button and you can see your errors and the correct results. Good luck and .. auf Wiedersehen!